Greg Harlow (left) and Nicky Brett. 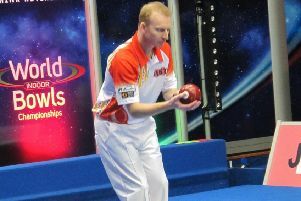 Local bowler Nicky Brett is through to the final of the World Indoor Pairs Championship with long-time partner Greg Harlow. The England pair will face Scottish stars Paul Foster and Alex Marshall in the final at the Potters Resort next Monday afternoon (January 21) which will be screened live on BBC2. Brett and Harlow reached the final with a 5-3, 7-2 semi-final victory yesterday over England’s Mark Royal and Andy Thomson. That followed an opening round 6-5, 9-2 defeat of Australian qualifiers Dave Rankin and Kyle McIlroy, who had caused an upset in the first round when they defeated highly rated Scots Stewart Anderson and Darren Burnett. Foster and Marshall booked their place in the final following a 2-9, 8-4, 2-1 victory over fellow Scots Ronnie Duncan and Colin Walker. 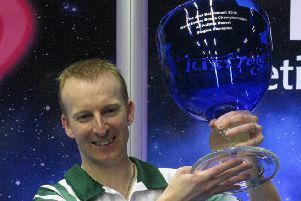 Brett is set to begin his singles campaign on Thursday (January 17) afternoon against the preliminary round winner and then on Friday (January 18) teams up with New Zealand’s Helen Carman in the first round of the mixed pairs against Scotland’s Stewart Anderson and Guernsey’s Alison Merrien.